The plates of the Stegosaurus ran in two rows down its back, in an alternating pattern. Palaeontologlsts think that these plates were a way of regulating body temperature in some way, alternately absorbing heat from the sun when the Stegosaurus needed warmth or dissipating excess body heat when necessary. Some theories also state that these plates made the Stegosaurus look bigger to its enemies, which was a sort of defense against predators . Another distinct feature of the Stegosaurus was its spiked tail. It had 4 spikes or spines on the end of its tail. Other stegosaur species had up to 8 spikes on their tails, depending on the species they were. The front legs of the Stegosaurus were a bit shorter than the rear legs, and powerful shoulder and leg muscles supported its weight, estimated to be between 5 and 10 tons. Its gait when it walked was probably very similar to the elephant of today. Its front feet each had 5 short toes, and its hind feet each had 3 toes. It stood about 14 feet tall on all four legs. 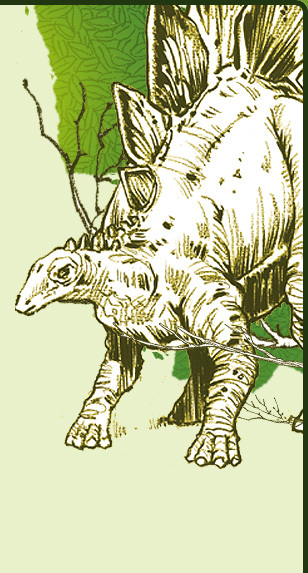 The Stegosaurus most likely preferred ferns, which grew in abundance during the Late Jurassic period in response to the heavy rains and climate of that time. It also might have eaten vegetation from conifers or other trees, as well as seeds from these plants. It was a low-level browser, meaning that it fed on vegetation that was easiest to reach. lt ate plants and vegetation that was at a height of 3-4 feet or less. The tips of the jaws of the Stegosaurus were covered by horny sheaths called rhamphothecae, which the Stegosaurus used to bite off or strip off the leaves or vegetation before chewing or grinding it up. Its teeth were adapted to grind up its food before swallowing it. There are theories that say that the Stegosaurus digested its food either in a gizzard (like modern birds of today do) or in its stomach. lt may have swallowed stones, or gastroliths, that would help to break down and digest the tougher vegetation. Skeletal evidence indicates that the Stegosaurus lived most of its life on the flood plains of ancient western North America. It may have preferred to live near water or wetter areas, where more of its food might have been easier to find. Since the Stegosaurus was a herbivore, it often was the object of interest to hungry carnivorous predators such as the Tyrannosaurus Rex. The Stegosaurus would stand its ground and defend itself, using its spiny tail. The spines or spikes were 1.5 to 2 feet long, and the Stegosaurus would swing its tail like a club, trying to drive its enemies away. Unfortunately it is hard to judge very much about the behaviour of the Stegosaurus because all the evidence of its existence that·is left is its fossils. But palaeontologists believe that the brain of the Stegosaurus was small - about the size of a walnut or a golf ball - compared to the size of its huge body. This might mean that the Stegosaurus relied on its dermal plates or armour and its tail spikes as its defense, rather than running away from its enemies as some other herbivores did. Some theories state that the Stegosaurus lived in herds, which may have offered it more protection from predators. As with other dinosaurs, the Stegosaurus laid eggs. The number of eggs in a clutch is uncertain, but is guessed to be six or more per clutch. Once hatched, the young probably had to be fairly self-sufficient in a short time, in order for them to survive. But there are also some palaeontologists that say that dinosaurs took care of their young much as modern birds do now, watching over their nests and even bringing the newly hatched little dinos their food. The plates on the Stegosaurus' back may have also played a part in courtship rituals or displays, and the spiked tail may have been used when fighting with rivals during mating season. The eyes of the Stegosaurus were located on either side of its head. This made it easier to spot potential danger, such as an approaching predator, more quickly. Smell may have played a big part in predator detection, as well, but also was important in helping to find the plants that the Stegosaurus liked to eat best. © 2018 Petrosains. All rights reserved.